For the bottom floor of a building with no basement, see Solid ground floor. For other uses, see Storey (disambiguation). A storey (British English) or story (American English) is any level part of a building with a floor that could be used by people (for living, work, storage, recreation). The plurals are "storeys" and "stories", respectively. 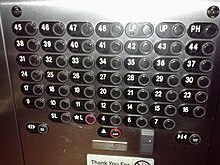 The terms "floor", "level", or "deck" are used in a similar way, except that it is usual to talk of a "14-storey building", but "the 14th floor". The floor at ground or street level is called the "ground floor" in many places. The words "storey" and "floor" exclude levels of the building that are not covered by a roof, such as the terrace on the top roof of many buildings. Houses commonly have only one or two floors. Buildings are often classified as low-rise, mid-rise and high-rise according to how many levels they contain, but these categories are not well-defined. A single-storey house is often referred to, particularly in the United Kingdom, as a bungalow. The tallest skyscraper in the world, Burj Khalifa, has 163 floors. The height of each storey is based on the ceiling height of the rooms plus the thickness of the floors between each pane. Generally this is around 14 feet (4.3 m) total; however, it varies widely from just under this figure to well over it. Storeys within a building need not be all the same height—often the lobby is taller, for example. Additionally, higher levels may have less floor area than the ones beneath them (e.g., the Sears Tower). In English, the principal floor or main floor of a house is the floor that contains the chief apartments; it is usually the ground floor, or the floor above. In Italy the main floor of a home is usually above the ground level, and may be called the piano nobile ("noble floor"). The attic or loft is a storey just below the building's roof; its ceiling is often pitched and/or at a different height than that of other floors. A penthouse is a luxury apartment on the topmost storey of a building. A basement is a storey below the main or ground floor; the first (or only) basement of a home is also called the lower ground floor. Split-level homes have floors that offset from each other by less than the height of a full storey. A mezzanine, in particular, is typically a floor halfway between the ground floor and the next higher floor. Homes with a split-level entry have the entire main floor raised half a storey height above the street entrance level, and a basement that is half a storey below this level. In Macy's Herald Square, there is a "one-and-a-half" floor between the first and second; this can be considered a split level floor. There are also multi-storey car parks, also known as parking garages. Each scheme has further variations depending on how one refers to the ground floor and the subterranean levels. The existence of two incompatible conventions is a common source of confusion in international communication. In all English-speaking countries the storeys in a building are counted in the same way: a "seven-storey building" is unambiguous, although the top floor would be called "6th floor" in Britain and "7th floor" in America. Mezzanines may or may not be counted as storeys. In most of Europe, the "first floor" is the second level. This scheme is also used in many former British colonies, many Latin American countries (including Argentina, Paraguay, Uruguay, and Brazil), in Hawaii (when using Hawaiian language) and in many of the Commonwealth nations (including Malaysia, except almost all of Singapore and most of Canada). This convention can be traced back to Medieval European usage. In countries that use this system, the floor at ground level is usually referred to by a special name, usually translating as "ground floor" or equivalent. For example, Erdgeschoss ("ground floor") in Germany, piano terra (lit. "ground floor") in Italy, begane grond (lit. "trodden ground") in the Netherlands, planta baja or planta baixa ("bottom floor") in Spain, beheko solairua in Basque, andar térreo ("ground floor") in Brazil, rés-do-chão ("adjacent to the ground") in Portugal, földszint ("ground level") in Hungary (although in Budapest the "félemelet" or "half floor" is an extra level between the ground and first floors, apparently the result of a tax evasion trick in the 19th century), parter (from French par terre, which means "on the ground") in Romania and Poland, prízemie ("by the ground") in Slovakia and pritličje ("close to the ground") in Slovenia. In some countries that use this scheme, the higher floors may be explicitly qualified as being above the ground level, such as in Slovenian "prvo nadstropje" (literally "first floor above ceiling (of the ground storey)"). In Spain, the level above ground level (the mezzanine) is sometimes called "entresuelo" (entresòl in Catalan, etc., which literally means "interfloor"), and elevators may skip it. The next level is sometimes called "principal". The "first floor" can therefore be three levels above ground level. In Italy, in the ancient palaces the first floor is called piano nobile ("noble floor"), since the noble owners of the palace lived there. In France, there are two distinct names for storeys in buildings which have two "ground floors" at different levels (on two opposite faces, usually). The lower one is called rez-de-chaussée (lit. "adjacent to the road"), the upper one is rez-de-jardin (lit. "adjacent to the garden"). The same differentiation is used as well in some buildings in Croatia. The lower level is called razizemlje (abbr. RA), and the upper prizemlje (PR). If there's only one ground floor, it's called prizemlje. The latter usage is standard for smaller buildings, such as single-family homes. The English-speaking parts of Canada generally follow the American convention, where the "first" floor is the floor at the ground level and the floor above it is the "second" floor. Canada, however, uses the spelling "storey", not "story". In Quebec, the European scheme was formerly used (as in France), but by now it has been mostly replaced by the US system, so that rez-de-chaussée and premier étage ("first stage") are now generally equivalent in Quebec. Mexico, on the other hand, uses the European system. In Latin America, planta baja and primer piso ("first floor"), which are distinct in Spain and Mexico, are equivalent in Chile and Peru, and refer both to the ground-level floor (although primer piso is used mainly for indoor areas, while planta baja is also used for areas outside the building). Most parts of eastern Asia—including China except for Hong Kong, Japan, Korea, and Singapore—follow this system[vague]. In the grammar of the respective languages, the numbers precede the word "floor", and are cardinals rather than ordinals, so they would translate literally as "1 floor, 2 floor" (etc. ), rather than "1st floor, 2nd floor", or "floor 1, floor 2". In Vietnam, the European scheme is used in the southern part of the country (most notably in the country's largest city, Ho Chi Minh City), but the American scheme is more prevalent in the northern and central regions (including in Hanoi, the capital). Cardinal numbers usually follow the word "floor" (i.e. floor 1, floor 2, or floor 3). Both systems are standardized, as TCVN 9245-1:2012 and TCVN 6003-1:2012 (ISO 4157-1:1998), respectively. The northern Vietnamese system is also used in Indonesia. In Singapore, the British system of numbering originally prevailed. This was replaced in the 1980s with the North American scheme for compatibility with other Asian countries. To emphasise the difference from the original scheme, reference is frequently made to storeys rather than floors, where the third (3rd) floor becomes either the fourth (4th) storey (or storey 4) or fourth (4th) level (or level 4). Many buildings continue to label storeys or levels rather than floors. However, in the absence of clear official distinction between the terms, the meaning of "floors" and "levels" have become interchangeable with "storey"; this is reflected in newer buildings. Some buildings in Singapore do use SL (Street Level) for ground level. Some buildings in Singapore, such as Nex and West Coast Plaza uses the European scheme, albeit using "Basement 1" for ground level storey. In Japan and Korea, "Floor 1" (1F) is usually assigned to the lowest floor that is at least partially above the ground level, so occasionally, 1F in these countries corresponds to the "lower ground floor" in the UK. 2F then corresponds to the "ground floor", 3F to the "first floor", and so on. However, some buildings in Japan do adopt the semi-European scheme of floor numbering, with G or GL (Ground Floor/Level) as the lowest floor partially above ground level and its 1F/1L is the lowest floor completely above ground level and so on. In the Philippines, the word "storey" itself is spelled in the British manner and is used to describe the total number of floors in a certain building, while the word "floor" is more commonly used when referring to a certain level. The American system is widely used but some buildings (such as Ayala Malls and older government offices) adopt the European system. Therefore, the words "ground floor" and "first floor" are interchangeable. The "Lower" and "Upper Ground Floor" tagging may also be used by malls and some office buildings that have one partially-lowered and another partially-raised ground level, both of which are accessible to the actual ground level by stairs or escalators. Under this system, the "third floor" officially becomes the "second floor" because of the two "ground floors", although people would generally call the upper ground level the "second floor" and the new second level to still be called the "third floor" out of convenience. In the Filipino language, both "floor" and "storey" are called "palapag". In Hawaii, the Hawaiian-language floor label uses British floor numbering; however, the English-language floor label use American floor numbering. Formerly, the English floor label also used British floor numbering (Ground floor, First floor, Second floor, which in Hawaiian is (Lepo papa, Papa akahi, Papa alua, respectively), but it was also replaced by North American scheme to make it the same as the rest of the US. To emphasise this difference, buildings in Hawaii use"level" rather than "floor". Thus, Lepo papa = Ground floor = Level 1, Papa akahi = First floor = Level 2, etc. Unusual floor numbering that reads B (basement floor), LG (lower ground floor), G, (ground floor), UG (upper ground floor), 1 (first floor), L2 (lower 2nd floor) and 2 (second floor). Some American high-rise buildings follow the British/European system, often out of a desire on the part of the building's architect or owners. 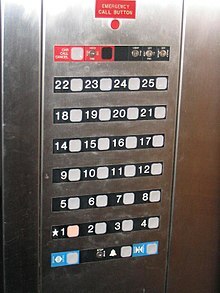 An arrangement often found in high rise public housing blocks, particularly those built in the United Kingdom during the 1960s and 1970s, is that elevators would only call at half the total number of floors, or at an intermediate level between a pair of floors; for example a lift of a 24-storey building would only stop at 12 levels, with staircases used to access the "upper" or "lower" level from each intermediate landing. This halves any building costs associated with elevator shaft doors. Where the total traffic necessitates a second lift the alternate floors strategy is sometimes still applied, not only for the doorway reduction but also, provisionally upon the passengers preferring no particular floor beyond capacity, it tends toward halving the total delay imposed by the stops en-route. A few buildings in the United States and Canada have both a "first floor" (usually the main floor of the building) and a "ground floor" below it. This typically happens when both floors have street-level entrances, as is often the case for hillside buildings. In the UK, the lower of these floors would be called the "lower ground floor", while the upper would be called either the "upper ground floor" or simply the "ground floor". Multi-storey car parks which have a staggered arrangement of parking levels sometimes use a convention where there may be an "upper" and "lower" level of the same floor number, (e.g. : "1U/U1" = Upper 1st, "L2/2L" = "Lower 2nd" and so on), although the elevators will typically only serve one of the two levels, or the elevator lobby for each floor pair may be between the two levels. In 19th-century London, many buildings were built with the main entrance floor a metre above ground, and the floor below that being two metres below ground. This was done partly for aesthetics, and partly to allow access between the lower level and the street without going through the main floor. In this situation, the lower level is called Lower Ground, the main floor is called Upper Ground, and floors above it are numbered serially from 1. There may also be a storage floor called "Cellar" below Lower Ground. In Norway and Sweden the floors are numbered as in the North American scheme ("1st" = "ground", "2nd", etc. ), but one can also refer to them by how many flights of stairs one needs to climb to reach them from the ground floor. So, in Swedish 2:a våningen ("2nd floor") is the same as 1 trappa upp ("1 flight up"); 3:e våningen ("3rd floor") is also 2 trappor upp ("2 flights up"); and so on. In modern lifts, however, floors are usually numbered according to British convention, where the street level is referred to E (for "entré", or entrance) or BV (for bottenvåning, or bottom floor) and the next floor is given the number 1. There are some cases, especially in shopping malls in the Philippines, that the floor numbering in the elevator does not align with the floor numbering that is created by the management. However, in order to avoid confusion from mall visitors, the usage of the management's floor numbering in advertising is more prevalent than the one posted in the elevators. There are some cases of odd floor numbering systems in the Philippines. In The Podium, the first basement of the expansion wing is called Lower Ground Floor, since the mall has a supermarket (shared with parking); however, its next basement is Basement 2 which serves the mall's carpark, instead of Basement 1 to continue its floor numbering. In City of Dreams Manila Carpark Building, the 4th floor of the carpark is called Upper Ground Floor although the first three parking levels are from Ground to 3rd level. The parking floor actually serves the Upper Ground Floor of the resort. Its next level is 5th level to continue with its floor numbering. In some instances, buildings may omit the thirteenth floor in their floor numbering because of common superstition surrounding this number. The floor numbering may either go straight from 12 to 14, or the floor may be given an alternative name such as "Skyline" or "14A". 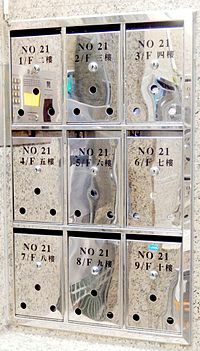 In Hong Kong the British numbering system is now generally used, in English and Chinese alike. In some older residential buildings, however, the floors are identified by signs in Chinese characters that say "二樓" ("2 floor") at the floor just above ground, as in the North American system. For those buildings, the Chinese phrase "三樓" or its English equivalent "3rd floor" may refer either to the storey three levels above ground (as in the modern numbering), which is actually labelled "四樓" ("4 floor"), or to the storey with the sign "三樓" ("3 floor"), which is only two levels above ground. This confusing state of affairs has led, for example, to numerous errors in utility billing. To avoid ambiguity, business forms often ask that storey numbers in address fields be written as accessed from a lift. In some mainland Chinese, Taiwanese and Indonesian buildings (typically high-rises), the 4th floor is actually omitted or skipped, along with other floor numbers ending in 4 such as 14th and 24th. The floor above the third would be numbered as the fifth, and so on. This is because of tetraphobia: in many varieties of Chinese (as well as the Chinese-derived numbers used in Korean, Japanese and Vietnamese) the pronunciation of the character 四 ("four") is very similar to the pronunciation of the character 死 ("dead" or "to die"). Also for this reason, apartments on the 4th floor in Asian countries such as Taiwan have traditionally been cheaper to rent. It is also common in China for the thirteenth floor to also be omitted. In Hawaii, the Hawaiian-language floor label uses the British System, but the English-language floor label uses the American system. For example, Papa akolu (P3) = Level 4 (4 or L4). In most of the world, elevator buttons for storeys above the ground level are usually marked with the corresponding numbers. In many countries, modern elevators also have Braille numbers—often mandated by law. In countries that use the European system, the ground floor is either marked 0, or with the initial letter of the local word for ground floor (G, E, etc. ), successive floors are then marked 1, 2, etc. However, even when the ground floor button is marked with a letter, some digital position indicators may show 0 when the lift / elevator is on that floor. If the building also contains floors below ground, negative numbers are common. This then gives a conventional numbering sequence –2, –1, 0, 1, 2, 3, ... In Spain and other countries whose official language is Spanish or Portuguese, the ground floor is usually marked PB (planta baja, planta baixa, etc. ), and in buildings where these exist, the entresuelo or entresòl and principal are marked E and P, respectively. In France, floors are usually marked the same way as in Spain; however, the letters for the ground floor are RC (rez-de-chaussée), seldom simplified to R. Where these exist, there are high ground RCH (rez-de-chaussée haut) and lower ground RCB (rez-de-chaussée bas), or garden ground RJ (rez-de-jardin) and former ground RC. In Portugal, the letters corresponding to the ground floor are R/C (rés-do-chão) or simply R.
For example, in the Polish language there is a clear distinction: the word parter means ground floor and piętro means a floor above the parter, usually with an ordinal: 1st piętro, 2nd piętro etc. Therefore, a parter is the zeroth piętro. Older elevators in Poland have button marked P for the ground floor (parter) and S for basement (suterena). Elevators installed since 1990 have 0 for parter and -1, -2 etc. for underground floors. In Hawaiian language, the labels, from the ground floor to the sixth (UK) / seventh (US) floor are, in order: LP, P1, P2, P3, P4, P5 and P6. In countries that use the North American system, where "floor 1" is the same as "ground floor", the corresponding button may be marked either with 1 or with a letter, as in the European scheme. In either case, the next button will be labelled 2. In buildings that have both a "1st floor" and a "ground floor", they may be labelled 1 and G (as in Russian scheme) or M (for "Main") and LM (for "Lower Main"). M may also be used to designate a mezzanine level, when it is not counted as a separate floor in the building's numbering scheme. In modern signage, at least in North America, a five-pointed star (★) additionally appears beside the button for the main entry floor. In the United States, the five-pointed-star marking is mandated by Title III of the Americans with Disabilities Act (ADA), as described in Section 4.10.12(2) of the ADA Accessibility Guidelines for Buildings and Facilities (ADAAG). There is no particular standard convention for the numbering of levels below ground. In English-speaking countries, the first level below ground may be labelled B for "Basement", LL for "Lower Level" or "Lower Lobby", C for "Cellar" or, in the case of the Andy Warhol Museum in Pittsburgh, U for "Underground". In British buildings, LG for "Lower Ground" is commonly encountered. If there is more than one basement, the next level down may be marked SB for "Sub-Basement". The lower levels may also be numbered B1, B2, B3, B4, B5, B6, B7, B8, B9, B10, etc.. Negative numbers are sometimes used: −1 for the first level below ground, −2 for the second one, and so on. Letters are sometimes used: A, B, C, D, E, F, G, H, I, J, etc. In Hawaii these levels are numbered I1, I2, I3, ...; "I" stands for "ilelo", basement. In malls, one may find half-height parking garages, in which the floors are named after the mall, but the floors that between the mall's floors may have suffixes like "A" or "M" added. For example, "1", "1A", "2", "2A", etc. The floors may be numbered as 1, 1½, 2, 2½, or "1", "1.5", "2", "2.5" etc. Elevators in half-height parking garages in malls usually stop only at the mall levels and not the parking levels between the mall levels. In split-level parking garages, the lower level may have the suffix "A" and the upper level have the suffix "B", like "1A", "1B", "2A", "2B", etc. Elevators in split-level parking garages normally stop at one of the two split levels or between the two split levels, and the levels in elevators may be named just "1", "2", etc. Elevator buttons may also be labelled according to their main function. In English-speaking countries, besides the common L for "Lobby", one may find P for "Pool" or "Parking" (and P1, P2, P3, P4, P5, P6, P7, P8, P9, P10, etc. for multiple parking floors), S for "Skyway" or "Street", R for "Restaurant" or Roof, PH for "Penthouse", OD for "observation deck", W for Walkway, T for Tunnel, Ticketing or Trains, etc. In some US buildings, the label G on the elevator may stand for the building's "Garage", which need not be located on the "Ground" floor. Fairmont Royal York Hotel in Toronto marks the first six floors as A, L, MM, C, H and 1 (for "Arcade", "Lobby", "Main Mezzanine", "Convention", "Health Club" and "1st floor"). The North Carolina Museum of Art, whose entrance is on the third floor up, has the floors lettered C, B, A (the main floor) and O (for "Office"). The Festival Walk mall in Hong Kong has floors labelled LG2 and LG1 ("Lower Ground 2" and "1"), G ("Ground") and UG ("Upper Ground"). In The Landmark Annex of TriNoma, DSn (n=floor) denotes the floor label of the department store area. In modern buildings, especially large ones, room or apartment numbers are usually tied to the floor numbers, so that one can figure out the latter from the former. Typically one uses the floor number with one or two extra digits appended to identify the room within the floor. For example, room 215 could be the 15th room of floor 2 (or 5th room of floor 21), but to avoid this confusion one dot is sometimes used to separate the floor from the room (2.15 refers to 2nd floor, 15th room and 21.5 refers to 21st floor, 5th room) or a leading zero is placed before a single-digit room number (i.e. the 5th room of floor 21 would be 2105). Letters may be used, instead of digits, to identify the room within the floor—such as 21E instead of 215. Often odd numbers are used for rooms on one side of a hallway, even numbers for rooms on the other side. An offset may be used to accommodate unnumbered floors. For example, in a building with floors labelled G, M, 1, 2, ..., 11 and 12, the fourth room in each of those floors could be numbered 104, 114, 124, 134, ..., 224 and 234, respectively—with an offset of 110 in the floor numbers. This trick is sometimes used to make the floor number slightly less obvious, e.g. for security or marketing reasons. In some buildings with numbered rooms, as in this Eastern European example, UK-like G, 1, ... floor numbering is used, but with rooms numbered from 200 on the "first floor" (above the ground floor), 300 on the 2nd floor, and so on. In buildings with only two corridors, all the apartments are marked as Esq. (Esquerdo = Left) or Dto. (Direito = Right). So we have C/V Esq. (Underground Floor Left), R/C Esq. (Ground Floor Left), 1º. Esq (1st Floor Left), etc. ; and C/V Dto. (Underground Floor Right), R/C Dto. 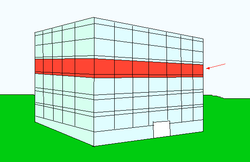 (Ground Floor Right) 1º. Dto. (1st Floor Right), etc. Buildings with more than two apartments per floor, are marked with letters, clockwise within each deck. So apartment 8º-D (not 8D) means the 8th floor (hence the character "º" meaning ordinal number), apartment D (counting in clockwise direction, for those who are in the floor entrance). But a very common form for buildings with three apartments per floor is, Esq.-Frt./Fte. (Frente, en: Front - for the apartment located between left and right)-Dto. These universal rules simplify finding an apartment in a building, particularly for blind people, who do not need to ask where a given apartment is. ^ "Story | Define Story at Dictionary.com". Dictionary.reference.com. ^ "Burj Khalifa – The Skyscraper Center". Council on Tall Buildings and Urban Habitat. ^ What does LL stand for? ^ sameish - Which Floor is Which? ^ "Bản vẽ xây dựng - Hệ thống ký hiệu - Phần 1: Nhà và các bộ phận của nhà" [Construction drawings - Designation systems - Part 1: Buildings and parts of buildings]. Tiêu chuẩn Việt Nam (in Vietnamese). 2012. Retrieved 2019-01-30 – via vanbanphapluat.co. ^ Perkins, Broderick (2002-09-13). "Bottom Line Conjures Up Realty's Fear Of 13". Realty Times. Retrieved 2008-04-14. ^ P may also stand for Parterre in some countries: http://onlinedictionary.datasegment.com/word/parterre. Look up storey in Wiktionary, the free dictionary. Chisholm, Hugh, ed. (1911). "Storey" . Encyclopædia Britannica. 25 (11th ed.). Cambridge University Press. p. 968.